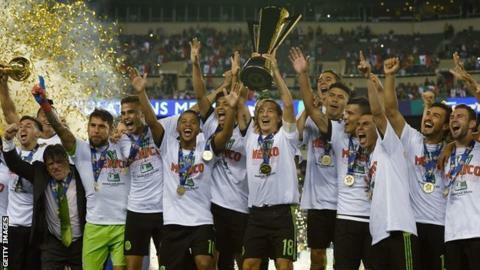 Mexico won a record seventh Gold Cup with a dominant win against first-time finalists Jamaica. Jamaica were the first Caribbean team in the final, but were unable to produce an upset as El Tri won their third title from the last four cups. Andres Guardado volleyed the opener in front of almost 70,000 at Philadelphia's Lincoln Financial Field. Jesus Corona and Oribe Peralta added goals before Darren Mattocks's late consolation. The Gold Cup is the continental tournament for teams in North and Central America and the Caribbean. El Tri's semi-final win over Panama was marred by ugly scenes, as players clashed and objects were thrown from the stands after Mexico came from behind courtesy of two penalties. But there was no such controversy in the final as the Reggae Boyz were soundly beaten, despite making a bright start. "We're very happy," Mexico manager Miguel Herrera said. "We dominated the ball. We got the rhythm we wanted and controlled the play. It's a great satisfaction for all of us." PSV Eindhoven's Guardado finished the tournament with six goals, one less than top scorer Clint Dempsey of the United States, as he was awarded the Golden Ball for being the best player. It was his 10th career Gold Cup goal, having also scored in a 2007 final loss to the USA and a 2011 victory over the Americans. After the break Corona and Peralta took advantage of defensive mistakes by Reading defender Michael Hector to extend Mexico's advantage before Mattocks pulled a goal back with 10 minutes remaining. "For me this is not silver. For me this is gold," Jamaica manager Winfried Schaefer said. "Nobody gave us a shot. This team played all its matches over its head. I'm very proud to coach this team. Jamaica should be very proud." Mexico have now qualified for a play-off against 2013 champions United States on 9 October for a place in the 2017 Confederations Cup in Russia.